Intercity or special train with only 2h 40 minutes journey makes Cracow available for a one day trip from Warsaw. CRACOW – The Royal City. A city over one thousand years old, located in the upper course of the Vistula river, a city called ”little Rome” and the ”cradle of European Culture”. 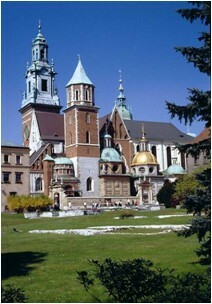 Cracow is rich in history, outstanding works of art and architecture. The city is the location of the Jagiellonian University (founded in 1364), the Royal Castle Wawel, with its mythical Cathedral and the largest and most beautiful town square in Europe. Cracow is a city complex unlike most others in Europe. The price includes: entrance fees, deluxe coach transportation and English guide assistance.